I was never one for new year resolutions. Most people are trying to get over the excess of Christmas and new year celebrations by going on a detox of some sort. Personally, I'm all about looking after myself and there is no better way to do so than to eat chocolate! It cheers me up and there's nothing like a nice chocolatey-type dessert and a cup of tea to make the day all the brighter, especially during these dark days of winter. Some will say that chocolate is unhealthy, but I consider it part of a balanced diet. The darker the chocolate the better and definitely gluten free. Be diligent when you buy your chocolate as you'd be surprised at how much gluten can be found in chocolate products out there. What better way to eat chocolate than in a cake! I'd love to take credit for this recipe, it's so good, but this was given to me by my Aunt. 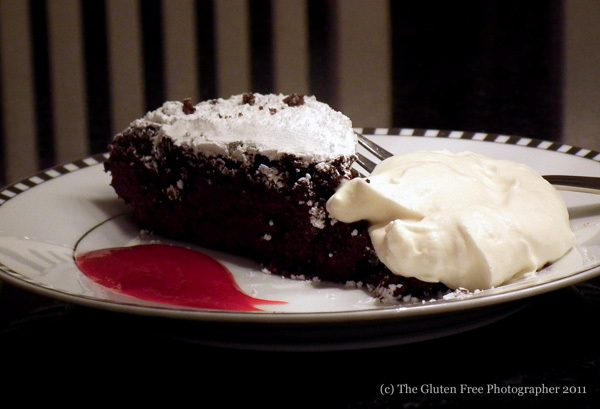 It is the best flourless chocolate cake recipe I've ever had the pleasure to come across to date and there isn't a rival to it. It looks like a heavy dessert, but its texture is almost like a mousse and it is beyond delicious. 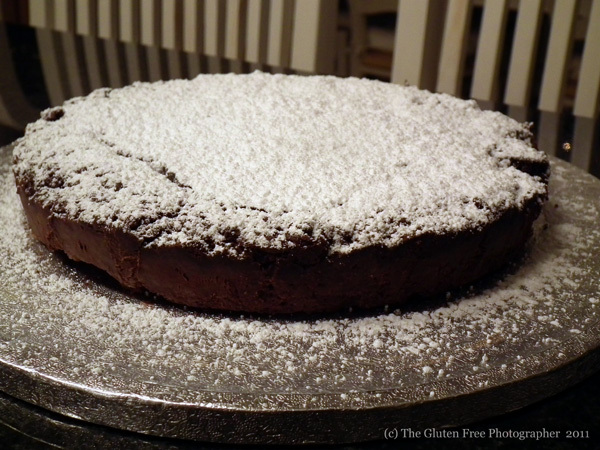 So I call this recipe Susan's Flourless Chocolate Cake. I have not had to tweak or change any of this recipe, it's that good. Easy to make and so tasty. Make sure to use a good chocolate when making this. Something more indulgent. If you like things a little sweeter, use half semi and half milk chocolate, or whatever suits your palate. - Preheat the oven to 160 degrees C.
- Butter and flour an 8 inch cake pan and also line the bottom of the pan with parchment paper. Use cocoa powder rather than flour to make sure it is completely gluten-free. - In the top of a double boiler, (a bowl over simmering water will work fine just make sure the water doesn’t touch the bottom of the bowl) melt the butter and chocolate together, mixing until smooth. Remove from heat. 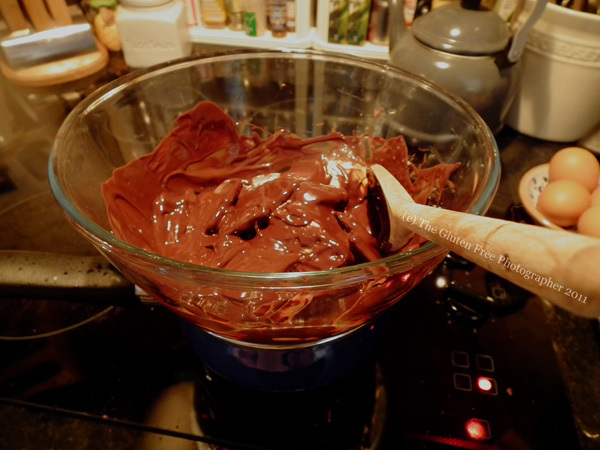 - Separate 5 eggs and add the 5 egg yolks to the chocolate mixture and whisk until smooth. - In a separate bowl, beat the 5 egg whites until soft peaks form. Add the cream of tartar, 1 tablespoon of sugar and beat until stiff, but not dry, peaks form. - Fold about 1/4 of the egg whites into the chocolate mixture. Then fold in the rest. - Pour batter into prepared pan and set the pan into a larger baking dish. 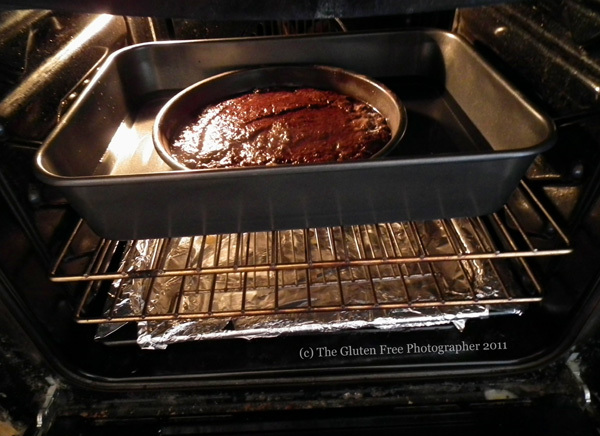 - Pour hot water into the larger pan to about half way up the side of the cake pan (a Bain-Marie). - Bake for 30 to 40 minutes. - Don't worry if it doesn't seem fully cooked. Just make sure you don't overcook or burn the top of the cake. 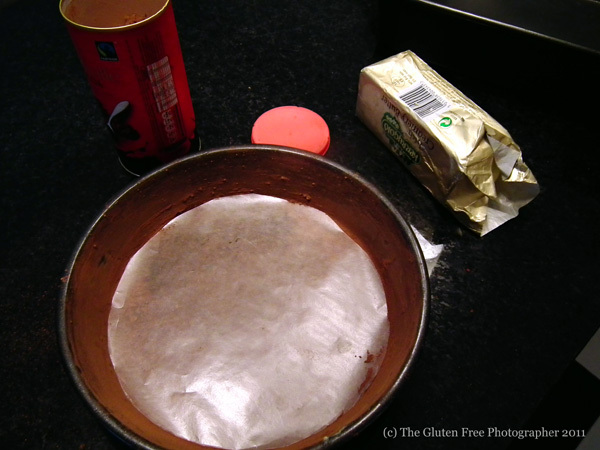 - Refrigerate until cold then slide a knife around the edge of the pan to loosen the cake and invert it onto a plate. - Dust with icing sugar (I take liberties here and put a lot of icing sugar on top of the cake, but feel free to use less or not bother at all! ), and serve with sweetened whipped cream and a raspberry coulis. This cake needs to be kept refridgerated. - To make the raspberry coulis - I blend a packet of thawed, frozen raspberries and then pass the mix through a sieve into a bowl. I then sieve icing sugar (to taste), into the coulis and whisk until dissolved. - To make the sweetened cream - I beat (use a mixer or a kitchenaid - if you have one), some fresh cream in a bowl till it starts to thicken. I then add pre-sieved icing sugar to the cream and continue to beat until it starts forming soft, but not firm peaks in the cream. Try to avoid over-beating the cream, as you'll end up with a buttery mix.